When you want to pull up ceramic tile, drill concrete, and demolish rock, you need a rotary hammer. These two combination hammers from Bosch are made to do professional-grade work. But how can you tell which one is best for your job? Let’s take a closer look to decide. 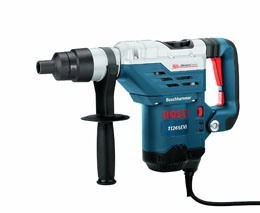 The Bosch 11264EVS is like a miniature jackhammer but without the vibration and recoil. It weighs 15.2 pounds but puts out 6.5 foot-pounds of impact energy. 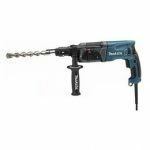 That means you can drill and chisel concrete faster with it than you ever could with a regular hammer drill. The bits it uses are SDS Max, not Spline ones like the Bosch 11265EVS described below. And the bit insertion system is simple enough to use with just one hand. You can set the bit into one of twelve different angles with Bosch’s Vario-Lock option. This feature helps you chisel more efficiently without having to hold the hammer awkwardly. 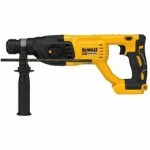 The 13Amp motor operates in two modes: hammer-only or rotary hammer. It has a built-in clutch that reduces the twisting action that happens if the bit gets bogged down or stuck. And even while you’re pounding away at rock, the Active Vibration Control dampens the tool’s vibrations to protect your hands from nerve damage. Unlike some competitor’s rotary hammers, the 11264EVS has a smooth start so you can maintain control from the moment you press the trigger. Then its Constant Response Circuitry keeps the bit speed uniform under load and protects against burnout. And should you hit a tough spot, you can use Turbo power in hammer mode to break through and get the job done. Finally, the variable speed dial lets you select between 170 and 340rpm and 1700 to 2900bpm. 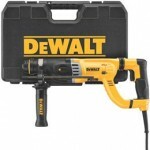 That way you can customize the amount of power you need depending on the material you’re drilling or demolishing. 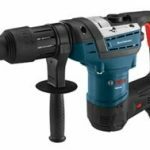 The Bosch 11265EVS looks similar to the 11264EVS until you examine the chuck. The 11265EVS accepts Spline bits, not SDS Max. Spline bits originated in America while SDS began in Europe. And Spline is a good system for large bits like 6” thin wall and 4” thick wall, or even bushing and digging attachments. As for the rotary hammer itself, the 11265EVS has a 13Amp motor with a dual mode selector just like the other tool above. You can choose between rotary or hammer modes, and tap into Turbo mode when hammering difficult materials. While it has 6.5 foot-pounds of impact energy, it weighs just 15.1 pounds. Its lower weight helps reduce fatigue, and so does it Vibration Control feature. There is a dampening system in the handle and the hammer mechanism itself. Less vibration means less risk of nerve damage down the road. 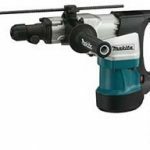 Like the other tool above, this one also offers twelve bit angle positions with Bosch’s Vario-Lock feature. At the same time, its clutch mechanism greatly diminishes torque reaction if the bit jams in the rock. There are also two other highlights that pro users will appreciate. First, the 11265EVS has a variable-speed dial that lets you set the appropriate speed for the substance you’re drilling. It ranges from 1700 to 2900bpm and 170 to 340rpm. And second, there is a service light that announces when the hammer needs preventative maintenance. These two Bosch combination rotary hammers are pro-grade tools, designed for regular use and hard work. They are very similar in appearance, weight, and power. The real difference between them is the bit system. The 11264EVS uses SDS Max bits while the 11265EVS requires Spline bits. The market overall favors SDS Max with a slightly wider variety available. If this is your first rotary hammer, you might choose the 11264EVS simply because of that fact. Otherwise, if you already have bits belonging to one system or the other, you can get the best rotary hammer to fit the bits you use the most. 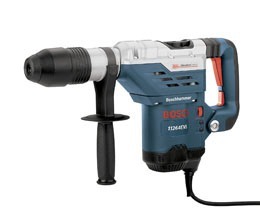 Click here to purchase Bosch 11264EVS on Amazon.com! 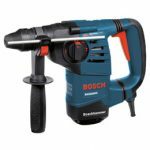 Click here to purchase Bosch 11265EVS on Amazon.com!